Sunchokes, also known as Jerusalem artichokes, do well in a bucket, as you can see above. The edible part is the tuber, found below the ground, where the plant stores its nutrients. When the season ends and the above ground part of the plant starts to die, it’s time to dig up your tubers. Sunchokes are a very cold-hardy plant! Planting sunchokes works similar to planting potatoes. You can buy sunchokes yourself that have growing points, those will generally work great to get the plant growing. I kept the two you see above here with the growing points on top apart, these two will be placed in the soil and will hopefully give me new delicious Jerusalem artichokes in fall. The tuber is about 2% protein and 17% carbohydrates. 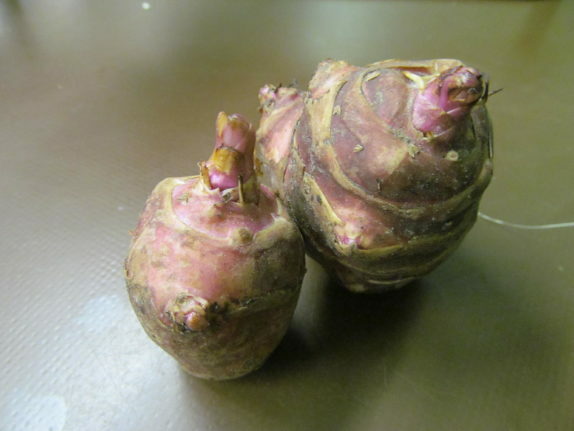 These tubers contain inulin, which some plants use as an alternative way to store calories rather than starch. Inulin causes a much milder increase in your blood sugar than starch does As a result, these tubers are quite healthy, especially for diabetics. The calorie content of the Jerusalem artichoke is comparable to that of potatoes, the yield per hectare seems to be comparable too. If all goes according to plan and conditions are good, you can expect a yield of up to 13 pounds of edible sunchoke tubers, from a five gallon bucket. Much of the information in our potato farm article applies to growing sunchokes too. Just as with potatoes, it’s important for you to ensure proper drainage in the bucket, to avoid crop failure. The best option is to drill drainage holes in the bottom of the bucket. Alternatively, you can fill the bottom few inches of your bucket with gravel and carefully avoid excess watering of the plant. 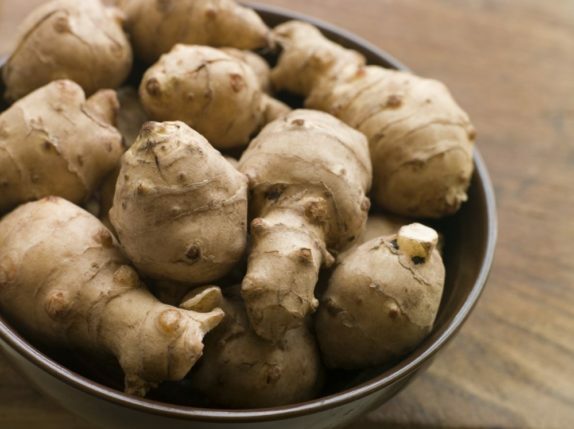 In contrast to the potato, which originates out of Southern Peru, the Jerusalem Artichoke was first cultivated by Native Americans in North America. As a result, this plant is naturally well adapted to colder climates. You might find it hard to get rid of them when you sow them, they can become weeds. For this reason, we recommend growing them in a bucket, unless you’re a permaculturalist who wants to set up a low-management edible garden. If you do grow them in your soil, it’s worth noting that harvesting them generally disturbs the soil less than harvesting potatoes does. 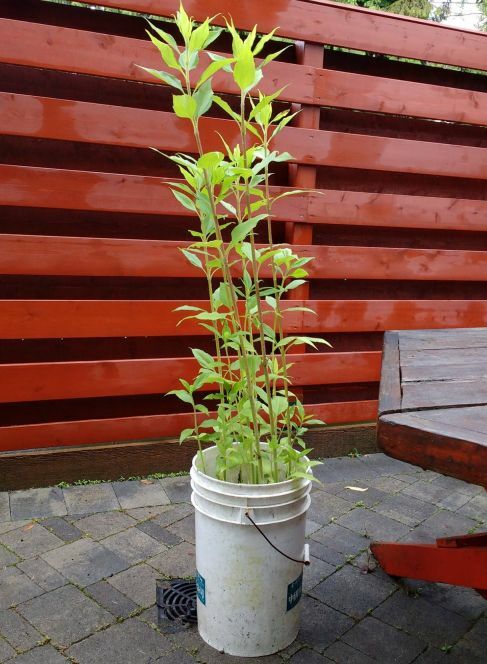 Your Jerusalem artichokes can be stored almost indefinitely in a container, as long as you keep them in some cool soil. When you get them out and clean them, they will last about three weeks. The potato plant is poisonous. The sunchoke plant on the other hand, can be used easily as animal fodder. Potatoes are notoriously prone to all sorts of disease. The Jerusalem artichoke has far less of such problems. One reason for this is because it’s less commonly grown. You can use sunchokes in a lot of different ways, but unlike potatoes, you can eat them raw too. They taste like water chestnut. You can also bake them, they require less time to prepare than potatoes. 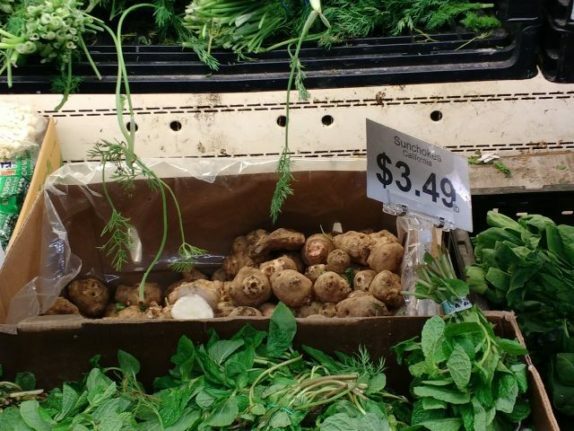 You might have noticed in your local supermarket that whereas potatoes are dirt cheap, you pay rather high prices for sunchokes. That’s because potatoes are grown in bulk. People might be unfamiliar with sunchokes, but when you tell them about the advantages of this crop, they’ll probably be as excited about trying them as you are about growing them. I got my seed sunchokes from Yumheart Gardens because they are reviewed so well. Now (February 2016) would actually be a good time to order them, as the season is just about to start. If you have any questions about growing sunchokes you can ask them here in the comment section, or to the supplier on Amazon.